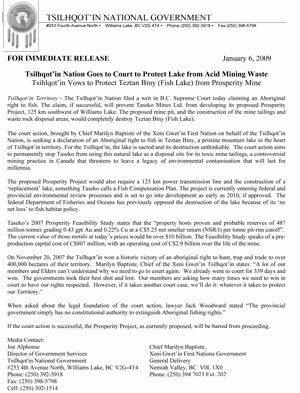 Williams Lake, BC – January 20, 2010: Tsilhqot’in National Government today expressed its deep disappointment and concern that Taseko Mines Ltd has announced to shareholders that it intends to compound all the mistakes of the past by resubmitting its failed Prosperity project. Tribal Chair Chief Joe Alphonse said, "We are concerned that, even though its ill-conceived proposed mine was emphatically rejected, Taseko Mines Ltd. has apparently learned nothing from wasting 17 years and $100 million of investors’ money pursuing this project despite clear warnings that neither our First Nations nor the federal government could accept it." Chief Alphonse said: "The Tsilhqot’in are not against development, but it must be done with respect for us as a people, with respect for the environment, and with a scientifically solid plan. "We had hoped that the ruling to reject the Prosperity mine proposal would serve as a catalyst for reform and a new relationship between governments, the mining industry and First Nations,” said Chief Alphonse. “This continues to be our hope despite this attempt to revive this dead project and the unproductive conflict that it has generated since the beginning." Chief Marilyn Baptiste, Xeni Gwet’in First Nation, said: "Taseko said all the way through the process that the only way to get at the gold was to destroy Teztan Biny and the surrounding watershed. How can it be, after so many years of doggedly saying there was no other way than to drain and destroy our sacred lake, that they suddenly have a new way forward? "To compound matters, after the project was rejected last Nov. 2, the company immediately began working with the Province and other mine supporters to revive this disastrous project without consulting our First Nations. We did receive a letter in January from the company’s president suggesting a meeting, but this was after the fact. Now we read in a company statement that it claims to have a new bid that will be acceptable – and we know nothing about it," said Chief Baptiste. "It is very difficult in these circumstances to believe the company is acting in good faith with us, or that it has any goal other than to force this totally unacceptable mine on us," said Chief Baptiste. TNG is unanimous in its position that the Prosperity Project is dead and is interested now in turning attention towards positive projects that fulfill its environmental mandate. "The right decision was made and it would be fruitless to look at this project again. The region needs to come up with alternative ways to economically diversify and to work with First Nations to achieve this," Chief Alphonse said. On November 2, 2010, then federal environment minister Jim Prentice announced the plan would not be approved, citing the "scathing" finding of the CEAA review panel report, which the federal minister said was "the most condemning" he had ever seen. The report noted the loss of Fish Lake, the inadequacies of the proposed replacement lake, the immense cultural impact and the impact on grizzlies and other wildlife would all cause "significant adverse effects." The CEAA panel and the federal department of Fisheries and Oceans also found two potential alternatives to be even worse than the rejected project. "It makes no sense that after 17 years, the company has found in a few weeks a new idea, or for it to claim it will be acceptable when it has not even talked to us or provided a hint as to what this grand new plan is," said Chief Baptiste. Chief Alphonse said: "Instead of wasting time and resources trying to bring a bad project back from the dead, we once again call on the province, local municipal government and industry to work with us to create viable diversified economic plans for this area." Chief Marilyn Baptiste, Xeni Gwet’in: 250.394.7023 x. 202 or 250.267.140"
BC ruled 35-hectare Lodge expansion would be too harmful to Fish Lake area, but a 35-sq km mine that would kill lakes and streams and lay bare the land is okay? The Tsilhqot’in Nation wants the BC government to explain why an area it deemed too sensitive for a relatively small lodge expansion in 2004 is now deemed insignificant enough to permit a huge open-pit mine to destroy lakes and streams and devastate 35 square kilometres of pristine wilderness. “How was Taseko Mines Ltd. able to get its patently unacceptable proposal to lay waste a 35-square kilometre area past a provincial government that only a few years earlier clearly stated First Nations rights and environmental concerns were too important to permit a 35-hectare expansion of a lodge in the same area,” said Xeni Gwet’in Chief Marilyn Baptiste of the Tsilhqot’in National Government. Tl’etinqox-T’in Government Chief Joe Alphonse, tribal chair of the Tsilhqot’in Nation, praised APTN for unearthing the story, which raises serious questions about the provincial government’s actions. “The federal departments of Fisheries and Oceans and of Transport have expressed serious objections, First Nations at the local, provincial and national level have spoken as one against the proposed mine, environment groups are against it, and BC’s own line ministries were recently so keen to protect the area that they turned down a lodge expansion. Only the company has been saying everything would be okay, yet this is the only voice the government has listened to,” said Chief Alphonse. Chief Baptiste added: “Are we to assume that the BC government will do anything and sell out any principles if the price is high enough? The APTN report raises serious questions about the validity of BC’s own environmental review process and its approval of the proposed Taseko mine. “This surely demonstrates how superficial the provincial assessment review was, and brings into question how carefully, if at all, the government actually checked out the benefits that the company claims its mine would generate or its claims that any damage would be mitigated,” said Chief Baptiste. Today the federal review Panel of the Canadian Environmental Assessment Agency (CEAA) made their long, and anxiously awaited, recommendations to the federal government re Taseko Mines proposed open pit gold and copper mine: the mine that would destroy Fish Lake/Teztan Biny. We are very pleased to say that the Panel made the best decision we could have hoped for! The Panel concludes that the Project would result in significant adverse environmental effects on fish and fish habitat, on navigation, on the current use of lands and resources for traditional purposes by First Nations and on cultural heritage, and on certain potential or established Aboriginal rights or title. The Panel also concludes that the Project, in combination with past, present and reasonably foreseeable future projects would result in a significant adverse cumulative effect on grizzly bears in the South Chilcotin region and on fish and fish habitat. The Panel notes that Taseko's propsoed "replacement" lake would not meet DFO's "No Net Loss" policy and that Taseko could not provide assurances that the fish in such a lake would be safe to consume. The Panel cites the effects on navigation would be "high magnitude and irreversible" as presented by Transport Canada's submission. The Panel places significant and detailed emphasis on the presentations and teachings from the First Nations witnesses who appeared before them, saying their "overall conclusion is that the Project would have a high magnitude, long term, irreversible effect on the Tsilqhot'in". They also noite that, "the effects of the Project on the potential Tsilhqot'in title would be significant as the value of the claim would be reduced substantially due to changes in the landscape and the loss of the area for current use for traditional purposes". In regard to grizzlies, the Panel says that Taseko's proposal to mitigate the effects of increased traffic (through speed limits, etc.) are not suffiecient to compensate for loss of habitat or landscape fragmentation. Reference to negative impacts on local use of meadows and trap lines is also included. We would like to congratulate everyone who wrote letters to the panel and who appeared before them. For many, this was a difficult and upsetting process to go through and it was done with great dignity and integrity. Thanks to you all. Now, it's up to the federal government to decide how they will proceed. 'Prosperity' mine builder wants to kill an entire trout-rich lake and build a new artificial one with no guarantees. Within days, likely, the federal review panel conducting the environmental assessment of the Taseko Mines 'Prosperity' gold-copper mine will issue its final report to the minister of environment. The reason is simple. The company was unable to provide any evidence that its project -- a 70,000 tonne per day open pit copper-gold mine in the Chilcotin -- would make a positive contribution to sustainability. And no, Taseko's offer to build an artificial new lake to replace the one it proposes to fill with mine waste doesn't begin to meet the sustainability test. Taseko's mine plan came to light in April this year when the review panel held community and technical hearings on the Prosperity project in Williams Lake and surrounding communities. According to Taseko's updated mine plan presented to the panel, the 33-year mine will generate some 858 million tonnes of potentially acid-generating waste rock that will have to be kept flooded in perpetuity behind a 100 metre plus high dam, high in the uplands of the Taseko River watershed, an important part of the valuable Chilko salmon runs in the Fraser River system. The need to maintain this dam forever poses a tremendous risk to Fraser River salmon, and an unsustainable legacy for future generations who make their living off the Fraser salmon resource. The company and the B.C. government, which handed Taseko a provincial environmental approval in January 2010, argue that while perpetual maintenance of flooded acid generating rock may be a significant environmental risk, failure of the dam is not a certainty -- such risks can be managed, they say. It is interesting to note, however, that the 2007 joint review panel investigating the proposed Kemess North mine recommended rejection of that project precisely on the basis of such risk being imposed on future generations, particularly since that panel had little faith that future provincial governments would step up to the plate to ensure that post-closure maintenance of the dams would be properly carried out. For Prosperity, while the acid-generating waste rock is a serious sustainability challenge, the real fatal flaw in the company's plans is the completely inadequate fish habitat compensation plan for the destruction of Teztan Biny, or Fish Lake, a 111 hectare, fabulously productive rainbow trout ecosystem that will be filled with mine wastes. Here there is no uncertainty. Proof of technical and economically viable plans to replace the ecological values lost is simply not in front of the panel. Teztan Biny will be a complete write-off. The mining company intends to fill Teztan Biny with waste rock from the mine, and to construct an artificial lake to compensate for its loss. This new waterbody, which Taseko ironically calls Prosperity Lake, is significantly smaller than Teztan Biny and is to be built on the upstream side of the tailings impoundment. In addition to the new lake, the compensation project includes engineered spawning channels at the inlet, and a (hopefully) self-regulating freshwater collection system to be built across the headwater slopes to collect and divert surface runoff into the spawning channels and the new lake. These components must function in an ecologically integrated fashion in perpetuity in order to preserve the rainbow trout population. To get the plans right, and to construct this system so that all the pieces will work together, forever, as a self-maintaining aquatic ecosystem is the big challenge faced by the company. The evidence before the panel is that such technology is beyond the pale of applied science. A feasible habitat compensation plan is also a legal requirement of the Fisheries Act, and DFO presented a critical analysis to the panel showing that Taseko's plan to replace Fish Lake was far from acceptable in this regard. Dr. Gordon Hartman, the eminence grise of freshwater fish biology in B.C. and a former consultant to DFO on the Prosperity project, went even further. Testifying before the panel on behalf of the Tsihlqot'in National Government, he characterized Taseko's plan as merely a "concoction of ideas," and accused the company of hubris in proposing such a grandiose and patently unworkable scheme. DFO up to the job? Other evidence submitted to the panel showed unequivocally that even for the individual components of the plan, such as trout spawning channels, the track record for success in the short-term is very poor, and for the longer-term simply not demonstrated. MiningWatch Canada's submission reviewed a number of audits of DFO's previously authorized fish habitat compensation projects and clearly shows a poor record of performance by proponents in achieving and maintaining the compensation objectives. Even DFO's track record came under attack at the panel. The Commissioner of Sustainable Development's scathing audit last year, submitted to the panel by MiningWatch, showed that DFO's system of tracking habitat compensation projects carried out by proponents is essentially dysfunctional, and the department cannot reliably determine whether such projects are successful or not. MiningWatch also presented the federal government's spending estimates for the next three years, which showed an approximate 30 per cent decrease in operating funds for DFO's Habitat Management Branch. The result of all this is that the panel is left with no evidence that demonstrates that Taseko's compensation plan for the lake is either technically or economically viable. Not only do the individual parts of the plan have dubious track records of success, but nowhere is there any evidence that a complete reconstruction of a multi-component aquatic ecosystem of any size, let alone the 93 square kilometre Teztan Biny watershed, has been attempted. Even after 17 years of developing its plans, and knowing all along that DFO would require a robust, demonstrably viable habitat compensation plan to address the loss of Fish Lake, the company provided no convincing evidence to the panel that the plans would work. So the panel is left with the fact that what the company plans to offer in compensation for the loss of Teztan Biny is unproven technology, and this is Prosperity's fatal flaw. Unproven technology proved to be the fatal flaw for a proposed copper acid heap leach mine when, just over a month ago, the Yukon Water Board rejected an application for an operating water license by Western Copper, the mine's proponent. Besides, even if Taseko did eventually manage to cobble together a feasible compensation project, it would be far from sustainable. As the company told the panel, it is committed to maintaining the compensation works only as long as mining continues at Prosperity, at which point its responsibility to keep the compensation project functioning would end. Hardly a recipe for sustainability. This is a 10 minute video news report from the Wilderness Committee about a protest rally that took place on June 16 2010, in downtown Vancouver in front of the Taseko Mining Ltd Annual General Meeting. The rally, organized by Harjap Grewal of the Council of Canadians drew about 70 people and featured several Chiefs of the Chilcotin Nation - including Chief Marilyn Baptise. Representatives of the Wilderness Committee were also there. RAVEN (Respecting Aboriginal Values and Environmental Needs) is a charitable organization that provides financial resources to assist Aboriginal Nations within Canada in lawfully forcing industrial development to be reconciled with their traditional ways of life, and in a manner that addresses global warming or other ecological sustainability challenges. Raven has produced a documentary film, Blue Gold, the Tsilhqot'in Fight for Teztan Biny (Fish Lake), and invites you to attend the Canadian film premiere, The film looks at Taseko Mines Ltd.'s proposed "Prosperity" mine that would see Fish Lake (Teztan Biny), Little Fish Lake (Naba) and the surrounding area destroyed as they gain access to the gold and copper reserves in the earth. In the place of these gorgeous, trout-bearing lakes, Taseko will leave behind an estimated 700,000,000 tons of tailings and waste material, including arsenic, mercury, lead, cadmium and other toxic metals. This toxic legacy will permanently scar the area, destroy habitat for major species like grizzlies, moose and deer, and potentially contaminate the largest wild salmon run in North America. The Tsilhqot'in Nation holds proven Aboriginal hunting and trapping rights in the area where Taseko wants to build the mine. "It is not possible for us to agree to the destruction of land that sustains us." - Chief Marilyn Baptiste, Xeni Gwet'in First Nation. How is it even possible to destroy a fish-bearing lake to support the private interests of a mining company? Recent changes in the Fisheries Act allow for the destruction of freshwater bodies in Canada. Once added to Schedule 2, lakes and rivers loose the protections of the Fisheries Act and are allowed to be used as toxic dumpsites for metal mining corporations. Teztan Biny is one of several lakes across Canada currently slated for destruction. The permanent destruction of the lake and watershed cannot be compensated ecologically. There are many other communities across Canada facing similar destruction of sacred places due to this short-sighted federal law. B.C. recently issued its Environmental Assessment Certificate for the mine - over the objections of the Tsilhqot'in Nation - which opens the door for Taseko to apply for the permits needed to clear and develop this site. Raven's quest is to convince the federal environmental review panel of the significant, irrefutable impacts that this project will have. You can find more information on the RAVEN website at www.raventrust.com. Public hearings commence March 22 in Williams Lake. In China alone, four tons of gold, 28 tons of silver and 6,000 tons of copper are used to make mobile telephones and computers each year. The gold is worth around €100 million ($135 million), equivalent to the monthly output of many a gold producing nation. According to the UNEP report, China will have 2.3 million tons of electrical refuse in 2010, including 500,000 tons of refrigerators, 1.3 million tons of televisions and 300,000 tons worth of computers. In terms if e-waste, China is second only to the US, which is likely to produce around three million tons of electronic rubbish in 2010. In 2008 the cost of the gold, silver, copper, palladium and cobalt was used to manufacture computers was €2.7 billion. That doesn't include the approximately 60 other materials that are also used in the production process. Meanwhile gold, silver and palladium are rarely recycled in Europe, UNEP says. Every year around €5 billion are lost in this way. The massive growth in the manufacture of electronic products means that this waste of resources threatens to grow even greater, the UNEP report continues. Future technology involving fuel cells or photovoltaic cells will further increase the need for these metals. Sales of mobile telephones reached a billion in 2007. The recent rush to promote mining as the saviour of the B.C. economy is an understandable, but dangerous and indefensible trend that serves neither British Columbians nor investors. Yes, The Vancouver Sun's Jan. 26 editorial did at least say there are problems, but its suggested solution was not to deal with the real root issues, but rather that we become more like Chile. It endorsed doing whatever the industry wants. For the most part, however, coverage has been artificially positive. Simply stating there is a boom and ignoring all the facts does not make a boom. Nor does it increase the chances that there will be one in the foreseeable future. There is a temptation to use the 2010 Vancouver Olympics spotlight to sell B.C. as an investment magnet, and if this involved delivering a full and balanced message to would-be investors, okay. To send highly misleading messages is quite another matter. Consider the recent giddy coverage. First there was the Federal Environmental Assessment Review approval of Terrane Metal's proposed Mount Milligan low-grade gold and copper project at Shus Nadloh on Nak'azdli first nation traditional lands. This followed provincial environmental assessment approval, and news coverage made it sound like nothing could stop the mine. The articles ignored Nak'azdli's news releases, its appeal against the provincial approval (due to be heard in March), and its application for a judicial review of the federal approval. When main backer Goldcorp announced a day after Nak'azdli filed for a judicial review that it would not exercise its option to partner in Terrane's mine, this story was down-played. Again, no mention was made of the legal challenges. Then came coverage of the province's environmental assessment review approval of Taseko Mines Ltd.'s proposed Prosperity Mine on Xeni Gwet'in traditional lands in the heart of Tsilhqot'in National Government territories. This mine would kill the pristine and culturally and ecologically important Fish Lake by turning it into a massive toxic tailing pond. The implication was this mine was a done deal. It was noted the company hopes to start land clearing and road building in the spring. The facts tell a different story. A separate federal environmental review has yet to be conducted and its hearings are weeks, if not months, away. The Xeni Gwet'in was not part of the provincial review, but is part of the federal one. Meanwhile the Tsilhquot'in has a court case underway to establish fishing rights and protect Fish Lake. This is surely information with which investors should be provided. The Sun recently ran a guest column by Gavin Dirom, president and CEO of the Association for Mineral Exploration British Columbia, which again promoted both the above projects as proof that mining is on the way back after 13 years of no major new metals mines being opened in B.C. It did not mention first nations, or the need to work with them to end the uncertainty that plagues the industry in B.C. Nor did it get into environmental impacts, or mention that nearly 1,200 closed or abandoned mines continue to pollute our waters and lands. Instead it promised a rosy picture of future great wealth and prosperity. The question is, for whom? The $500 billion that Dirom says has been generated by mining over the past 150 years have come from first nations lands and resources that were never ceded through any treaty. What first nations have got out of it is abandoned and polluting mines, and they are worried this could be all they will get out of any future mines in the long term. First Nations Women Seeking Responsible Mining supports the BC First Nations Mining and Energy Council and other first nations leaders in the struggle to bring urgently needed reform to mining legislation in B.C. Anne Marie Sam and Chief Marilyn Baptiste are members of BC's First Nations Women Seeking Responsible Mining. OTTAWA — Tribal chiefs from B.C. planned for months to travel to Ottawa in an attempt to save a lake they’ve used for 5,500 years from destruction, but with Parliament prorogued were left discouraged this week at not being able to speak with any key cabinet ministers. “On the one hand we’re frustrated but, on the other hand we’re not really surprised,” Roger William, past chief of the Xeni Gwet’in First Nations said in Ottawa Thursday. The three chiefs, and one former chief, from the Williams Lake area in the B.C. interior are trying to save Fish Lake from being turned into a toxic waste dump for a massive gold and copper mine. Mining operations don’t only pull gold and copper from underground, but waste rock that needs to be stored underwater to prevent it from releasing toxins into the environment. Traditionally, mining companies built their own tailings ponds but in 2002 an amendment to the Fisheries Act allowed four lakes and a creek, long since destroyed by mines, to be reclassified as “tailings impoundment areas.” Since then the federal government has reclassified at least six additional lakes as dumps. The proposed Prosperity Mine at Fish Lake would require the same reclassification to move forward. The B.C. government recently approved the mine through its environmental assessment process and the chiefs are awaiting word from the federal government’s equivalent body. “We’re very, very concerned and are demanding that the Canadian government drop this policy, stop allowing mining companies in this country to destroy clean lakes and ecosystems,” said Maude Barlow, water campaigner and national chairperson of the Council of Canadians, who met with the group Thursday. I would like to express my utmost disappointment regarding the provincial government’s recent approval of Taseko Mines Prosperity project. I was also shocked to hear our MLA Donna Barnett refer to this project as “environmentally friendly” and assert that this is an “exciting time for everyone.” Not everyone in the Cariboo is excited about this proposed project. How can a open pit mine (one square kilometres) with a tailings pond that will permanently destroy the pristine Fish Lake (Teztan Biny) and Little Fish Lake and their aquatic ecosystems forever be considered environmentally friendly? Fish Lake is one of the most productive spawning and fishing lakes in the Cariboo. Building another human-made lake to compensate for the loss of Fish Lake can never adequately replace a natural lake and its surrounding aquatic communities. Moreover, since the proposed mine site is within two kilometres of the Taseko River, this salmon-bearing watershed is also at risk from long-term contamination. Clean freshwater is a very precious gift and resource. While humanity faces a global water crisis, why would we as a society allow the destruction of a vibrant fishing lake here in British Columbia? Another issue related to this proposed mine is that it lies within the traditional territory of the Tsilhqot’in National Government. 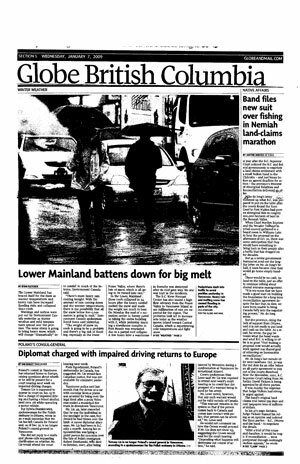 In January 2009 the TNG filed a writ in B.C. Supreme Court, asserting their title and rights to this area and demanding that the destruction of Fish Lake be stopped. Why is this project being allowed to proceed without the approval of local First Nations? I hope that the federal review process, through the Canadian Environmental Assessment Agency, demonstrates less bias than the provincial process. This mine should not be allowed to proceed unless an alternative option (to destroying Fish lake) is employed. OTTAWA - Six chiefs from an Interior B.C. First Nation spend the next several days in Ottawa as they battle a proposal they fear will turn a sacred lake into a waste dump. The chiefs from the Tsilhqot'in Nation of south-central B.C. plan meetings with MPs and top bureaucrats in hopes of halting a Taseko Mines' proposal to drain Fish Lake. Tsilhqot'in call the area Teztan Biny and say the two kilometre-wide open pit proposed mine, tailings pond and other developments will destroy the entire ecosystem in the region around Williams Lake, 600 kilometres north of Vancouver. Chief Marilyn Baptiste say the chiefs unanimously reject the draining of Teztan Biny to stockpile mining waste for Taseko Mines. MiningWatch and the Council of Canadians helped arranged the Ottawa visit and say a loophole in the Fisheries Act allows for the destruction of freshwater bodies in Canada. They say Teztan Biny is one of several Canadian lakes affected by the loophole and public hearings on the future of the region begin in Williams Lake on March 22. The Prosperity project must be stopped. While the B.C. environmental office was busy approving Taseko Mines’ proposal to destroy Teztan Biny, the Tsilhqot’in nation continues to view the land and water as a living thing. Our bodies are part of this land. If you damage the land, then you hurt us. For anyone who knows the Taseko area, the mining industry has already left a legacy of dirty water and hazardous waste without contemplation of a clean-up strategy. Camp equipment, diesel barrels, metal pipes, etc. have yet to be withdrawn by “responsible” outfits. This extends to current mining operations and a general lack of government accountability within the region. After companies have stolen the riches, they leave local indigenous people with all the consequences of their exploitation. This total disregard for the land hurts us personally. Many settlers from Williams Lake and politicians have promoted the Prosperity project without an honest expression of respect for our home. True owners do not willfully destroy their place of occupancy. For this reason, it is also difficult to take the B.C. environmental office seriously. Moreover, in approving Prosperity Mines, public officials have compromised their integrity by failing to account for another 13 years of impact; this omission illustrates an obvious lack of diligence. For Tsilhqot’in, people of the river, the water is what binds us. Water is a life source; it is a primary resource to the regeneration of plants and animals, which become a part of us. The priority to be fed by fresh water and clean food is much more valuable physically and spiritually than metals and the invisible market fluctuations of money. So we ask: why persist in jeopardizing the future inheritors for short-term profit? While fear silences people, our words present courageous love for our place. January 18, 2010, Williams Lake – The Tsilhqot‟in National Government denounced the BC Environmental Assessment Office (BCEAO) decision to grant an environmental assessment certificate (EA) to Taseko Mines Ltd. for a proposed massive mine at Teztan Biny (Fish Lake), an area where the Tsilhqot‟in Nation holds proven Aboriginal hunting and trapping rights. “We are disappointed, but not surprised,” said Chief Marilyn Baptiste, Xeni Gwet‟in First Nation. “It has been clear from the outset that this is a rubber stamp exercise.” The Chief explained that the BCEAO has rushed to a decision based on the same record that an independent federal panel has deemed fundamentally deficient on key issues. One issue on which the proposed mine has been found deficient is current use of the area by First Nations for traditional purposes. The federal Panel has held that Taseko‟s treatment of this issue is deficient and has extended First Nations the opportunity to provide this critical information directly at the public hearings to be held by the Panel. TNG does not support destroying Teztan Biny (Fish Lake) and Nabaŝ (Little Fish Lake) as part of the proposed Prosperity Gold-Copper Mine in central British Columbia. Taseko‟s plan is to drain the pristine, trout-bearing Fish Lake and dump waste rock there. Little Fish Lake would be turned into a tailings pond. The mine will transform the Teztan Biny watershed into an industrial zone, and disrupt the cultural, spiritual and ceremonial practices that the Tsilhqot‟in have exercised on these lands for centuries. TNG has also expressed concerns that the mine will not only destroy important fish habitats, but also will heavily affect grizzly bears, moose, deer, beaver and other wildlife in the region. TNG says it is still reviewing the report and considering its options for a more direct response. “We are hopeful that the federal review panel will take a more diligent and responsible approach to this proposed mine, and act as a safeguard for the public interest, rather than a rubber stamp for industry,” said Chief Baptiste. As Canadians head this summer to lakes and rivers to enjoy our beautiful freshwater heritage, most probably think the water is well protected by the Canadian government. Nothing could be further from the truth. There was a time in the 1960s and '70s when environmental protection for our freshwater supplies was strong and scientists were respected and heard. Over the next decades, freshwater policy was increasingly politicized and environmental concerns were forced to compete with demands to use these waterways and watersheds for industrial development. Many responsibilities for water were handed over to the provinces, creating a mishmash of policies. The Freshwater Institute and the National Water Research Institute were essentially gutted in successive budgets, leaving a dramatically reduced role for the federal government. contamination." Yet we have just started to map our groundwater supplies and it will take two decades to assess their sustainability. The Great Lakes are terribly polluted and are being drawn down faster than the recharge can replenish them. Lake Winnipeg is very sick. The Athabasca River's existence is imperilled by the unrestrained water takings and contamination from the production of heavy oil in the Alberta oilsands. Through its effects on evaporation and snowpacks, climate warming is exacerbating the problems. We also have 1,300 melting glaciers, all of them due for total melt. Yet the Stephen Harper government has no concrete plans to combat global warming. Canada is the only industrialized country not to have a national drinking water standard. While drinking water in our cities is thankfully safe and regulated by the provinces, the state of water in First Nations communities-- a federal responsibility -- is a travesty. Many other small communities also have questionable water supplies. The Harper government has continued the assault on our water heritage. It does little to enforce the Fisheries Act, generally regarded as Canada's toughest water law. Half the mining operations in Canada violate the act. The 2009 federal budget essentially gutted the Navigable Water Protection Act, which protected our waterways as a public trust and required an environmental assessment to build dams, bridges and other major developments. Now the decision for environmental assessment to protect our navigable water systems from overdevelopment rests with the transport minister. This is part of a planned overhaul of the Canadian Environmental Assessment Act, which might see federal environmental assessments drop by 95 per cent. Not content with its abandonment of Canada's freshwater heritage, the Harper government is now putting the international freshwater program in danger as well. For 30 years, Canada has hosted the Global Environment Monitoring System, assessing more than 3,000 freshwater sites around the world and supplying 24 UN agencies with vital information upon which to build and assess water policy. In early 2008, senior Environment Canada officials told GEMS scientists that the program would no longer be funded in Canada. After a public outcry, Environment Minister Jim Prentice contradicted his officials and said the program would remain after all; but the funding allocated is only $500,000 a year--half the already diminished previous budget and nowhere near enough to keep the program going. As a result, GEMS scientists could not continue their contribution to the 2010 Biodiversity Indicators Partnership report, an important initiative to track and recommend on invasive species and loss of biodiversity. Nor could they contribute global indicators to the recently released UN World Water Development Report, arguably the most comprehensive compilation on the world water crisis ever written. Ottawa's lack of support for this internationally renowned program is embarrassing. The world is experiencing a growing water crisis that poses one of the greatest ecological and human threats of our time. The Canadian government must get its act together now. David Schindler is the Killam Memorial professor of ecology at the University of Alberta. Maude Barlow is national chairwoman of the Council of Canadians and senior adviser on water to the president of the UN General Assembly. The study conducted by renowned Colorado-based Stratus Consulting concludes that Taseko’s Environmental Impact Statement (EIS) for the Project “vastly underestimate[s] the uncertainties in site water balance.” The report notes that Taseko has relied on limited data to predict or prepare for extreme weather events: “After operations, they propose leaving their mine waste in place with no active controls. One extreme weather event at any point in the future could lead to an uncontrolled release of mine waste, which could have severe adverse consequences for the trout and salmon fishery of the Taseko River.” The Taseko River flows into the Chilcotin River, which empties into the Fraser River. The Stratus report states that because of the known impacts of hardrock mining, it is critical that Taseko Mines identify reasonable potential effects and include short-term and long-term mitigation and management measures and monitoring in its mine proposal. Stratus Consulting undertook the hydrology review at the request of both the Tsilhqot’in National Government (TNG) and the Williams Lake Indian Band. The three-member Panel conducting the federal environmental assessment of the proposed Prosperity Project has expressed similar concern. The Panel has requested clarification from Taseko as to whether its current EIS is sufficient to address the expanded project that Taseko recently announced. It is too bad that the people of Williams Lake do not have a reliable local source of information regarding Fish Lake and Taseko's so-called “Prosperity” Project. The Tribune, rather than fulfill its obligation to report the news in an unbiased manner, chooses instead to promote its own pro Prosperity bias, repeat verbatim Brian Battison's propaganda, and ignore a TNG press release telling the other side of the story. Battison and the Tribune choose to misinterpret the CEAA Panel's request for more information from Taseko. They portray Taseko's failure to provide information regarding FN traditional use as the fault of First Nations. The fact is that Taseko was urged by the Panel to work with First Nations to develop this information. In other words Taseko was enjoined to co-operate with First Nations. It has chosen not to do so, no doubt fearing what it would learn. It is Taseko that is deficient here, not First Nations. It is Taseko that wants this mine, therefore it is Taseko that must pay for the studies that the Panel requires to make a decision. First Nations do not want it, so why should they pay from scant resources to help Taseko get approval? Surely this simple logic is not beyond the capacity of the Tribune editor and Brian Battison? Early on in this process Battison said the mine would not proceed if First Nations did not want it because Taseko respects First Nations and their rights. He has now heard from the Tsilhqot'in and other First Nations; no mine!. So why is Taseko still trying? There is lack of respect here that reveals the colonial mindset. In 1968, the creation of the WAC Bennett Dam amassed the world’s largest artificial lake, the Williston Reservoir. The rising waters flooded the Sekani from their homelands and resulted in the destruction of the lower half of their watershed. The Tse Keh Nay - the Takla Lake, Tsay Keh Dene and Kwadacha First Nations – fought through a flawed environmental assessment process for 5 years. This is their story. Film will be followed a presentation by Loretta Williams, from the Tsilhqot’in Nation, about their own campaign to protect Teztan Biny (Fish Lake) from the proposed Prosperity Mine. Similar to the Northgate Minerals proposal for Amazay Lake, Taseko Mines Ltd. is also proposing the use of Teztan Biny as a tailings lake, a practice that since 2002 has been supported by controversial changes to the Fisheries Act under Schedule 2. In 2006, two lakes inNewfoundland were approved for destruction and many other lakes in BC, and across the country, are threatened by this loop hole provided by the federal government for the mining industry. The Tsilhqot’in Nation have filed a writ in B.C. Supreme Court claiming their Aboriginal right to fish. The claim, if successful, will prevent Taseko Mines Ltd. from developing its proposed Prosperity Project, 125 km southwest of Williams Lake. 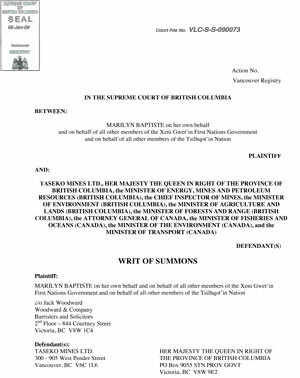 The Governments of BC and Canada will most likely appeal a title case decision right to the Supreme Court of Canada and the Tsilhqot’in will need your support! This event organized and sponsored by the Council of Canadians and the Wilderness Committee. For more information please email hgrewal@canadians.org or call 604 340 2455. The demonstration has been called by the Tsilhqot'in Nation in defense of Teztan Biny (Fish Lake) and other lakes threatened by mining development, and in defense of indigenous sovereignty, title and rights. Please come and stand in solidarity with the Tsilhqot'in and demand justice! I am not opposed to mining per se, and I support sustained economic development; but I found your editorial in support of Campbell’s comments disturbing. Weeks before the environmental assessment hearings, without any evidence yet in, you have prejudged the mine as beneficial for this area. It seems to me that your editorial prejudiced the situation in favour of businesses in Williams Lake, and against a fair hearing for other legitimate stakeholders. Tsilhqot’in heritage is a case in point. Although Campbell may have toured the mine site with Prosperity Mine officials, there is much he could not possibly have been aware of in terms of the cultural significance of the area to Tsilhqot’in. The area around the lake contains at least 11 graves (Prosperity lists only two in Vol. 7 of their EIS Report). There are at least a hundred significant known sites including house depressions and cache pits; one rare find (T3) is of such great scientific significance that Tyhurst (1993) identified it as one of only three like it in B.C.. This site contains microblades, house depressions, a cache pit, and faunal remains in close proximity, as well as one of the two grave sites located close to the proposed pit. The mining and proposed tailing area also contain one and perhaps two cremation sites; the last resting place of dozens of Tsilhqot’in ancestors. The cremation sites alone render the area sacred to Tsilhqot’in. As an idea of how personal and traumatic the destruction of Fish Lake can be to Tsilhqot’in, there are elders living who are only two generations removed from some of the latest grave sites. The destruction of Fish Lake is the cultural equivalent in Tsilhqot’in terms of taking a bulldozer to level Stonehenge to make way for a casino. You mention $90 million having been spent by Taseko studying the mine project including wildlife, plants, water and consultation. But you do not mention what percentage of the $90 million was actually spent on consultation. In fact most of the consultation process as outlined in Vol. 7 of the Prosperity Report is confined to a list of e-mails. Much of the archaeology was done through flyovers of the proposed access corridor because of time restraints placed upon the archaeologists themselves. Even so, the limited studies by archaeologists working for Taseko estimate that the areas around Fish Lake have been in continuous use for at least 7,000 years. Considering this long record of occupancy how many other sites are as yet unrecorded? The cultural and heritage portion of the Prosperity presentation (Vol.7) is the least detailed, the least researched portion of the study, and is riddled with inaccuracies. In short, it is scant in the scope and depth of its scientific research, and dismissive of the cultural value of the sites. Tsilhqot’in history has yet to be recorded. It is stored in the memories of the elders, and in thousands of unexcavated sites across their territory including those at Fish Lake. In reading comments in your paper it sounds to me as if the deck has been stacked against the Tsilhqot’in. Perhaps a good article in your paper on the cultural and spiritual importance of Fish Lake would be a good step towards restoring some balance. Tl’etinqox (Anaham) chief Joe Alphonse says it’s “ludicrous” that the federal Prosperity review panel will not recommend a 90-day extension of its public comment period of the Prosperity Mine project as requested by the Tsilhqot’in National Government. The TNG had requested an extension to the current 60-day comment period that began March 26 since it hasn’t yet received the $300,000 in participant funding that the Canadian Environmental Assessment Agency announced it would be getting. “That’s how funding works when you’re dealing with federal and provincial governments with the First Nations, and it doesn’t make any sense at all,” Alphonse says. In a letter dated Wednesday to TNG mining co-ordinator Loretta Williams, panel chair Robert Connelly notes the federal minister of environment would have to approve the extension, and the panel will not recommend he do so. Connelly notes that the TNG has had previous opportunities to review Taseko Mines Limited’s Environmental Impact Statement (EIS) for the mine, 125 kilometres southwest of Williams Lake. As of Wednesday, the agreement for $300,000 in participant funding from the CEAA had not been concluded. “That’s bad business to go spend money when you don’t have an actual signed contract,” Alphonse says. He writes the panel is not restricted in considering comments that may be received after May 25, the last day of the current 60-day public comment period, because the panel has to determine whether the EIS is sufficient to proceed to hearings within 30 days — June 24 — or whether Taseko needs to provide more information. “Stay tuned. It’s not over,” Alphonse says. “This is their (Taseko’s) government working at it, and this is their government that’s creating a happier environment for big industry, and we have to do what we have to do to protect our interests, and we ain’t letting this go. The federal prosperity review panel will not recommend a 90-day extension of its public comment period of the Prosperity Mine project as requested by the Tsilhqot'in National Government. In a letter dated today to TNG mining co-ordinator Loretta Williams, panel chair Robert Connelly notes the federal minister of environment would have to approve the extension, and the panel will not recommend he do so. Connelly notes that the TNG has had previous opportunities to review Taskeo Mines Limited’s Environmental Impact Statement (EIS) for the mine, 125 kilometres southwest of Williams Lake. “The Panel notes that the Agency, on behalf of the Minister of the Environment, provided opportunity to review the draft terms of reference, including the proposed timelines, in November and December, 2008. During that time interested parties, including the TNG, provided comments on the draft terms of reference. The only comment received at that time regarding the timelines for the review was made by Taseko Mines Ltd, requesting that the timelines be shortened,” Connelly writes. In that letter, Taseko vice president of corporate affairs Brian Battison writes that sufficient time has already been alloted. “Beginning in April 2006, the TNG have been invited to attend no less than 17 technical working group meetings where their views on process, study design, terms of reference and results and data analysis were sought. The TNG chose not to participate in any of these meetings. Battison also noted the protest at the April 2 Canadian Environmental Assessment Agency (CEAA) and B.C. Environmental Assessment Office open house in Alexis Creek forced its cancellation. In an April 17 letter in response, TNG' prosperity director Bernie Elkins says the TNG cannot participate in the provincial technical working group meetings because “actions of the provincial government, prompted by Taseko, have shattered the confidence of the Tsilhqot’in leadership and the Tsilhqot’in people in the integrity of that process,” referring to efforts to have the project assessed by a joint provincial-federal review panel. The BC Environmental Assessment Office decided it would not support the idea because Taseko and the TNG could not come to an agreement on the panel process. “In its comments to the panel, Taseko continues to attack the motives and character of tthe Tsilhqot’in leadership simply because they currently oppose development of the Project until the EA process in complete,” Elkins wrote, adding the TNG’s request was not a delay tactic. As of today, the agreement for $300,000 in participant funding from the CEAA has not been concluded. He writes the panel is not restricted in considering comments that may be received after May 25, the last day of the current 60-day public comment period, because the panel has to determine whether the EIS is sufficient to proceed to hearings within 30 days - June 24 - or whether Taseko needs to provide more information. “Comments received in advance of June 24 may still be considered by the panel and if received too late to be considered by the panel in making this decision, can still be taken into account as information for the continuing review up to and including the public hearings. Battison says the panel decision was the right one. In an interview, Elkins, also Alexandria chief, says he is disappointed with the panel's decision. "We're not against development," he says. "We want to go through this process on our terms." He says the timelines are inadequate because the TNG needs to build capacity and have the ability to outline what its needs, wants, and desires are for the project that he says is going to "leave a large, deep footprint in our backyard." He says TNG has 60 days to review the project, whereas Taseko has had nine years. "They're more prepared and we're not," he says, adding that TNG is willing to work with the federal review panel and is in the midst of hiring contractors and reading documents. He says the TNG never previously provided comments on the timelines because it didn't have the capacity to do so, as it lacked mining staff and contractors to help the organization fully understand. "Taseko has not partnered up with us, they haven't included us, so we have to get this outside expertise," Elkins says. "To me, that's the biggest problem." He stresses that the TNG isn't against development. "We're not opposed to the mine, per se," he says, noting that the TNG needs to go through the environmental assessment process to fully understand the project. He adds that there are also concerns about confidentiality of their tradition areas, as that information is posted online. He says there has never been time to discuss those concerns with the panel. "People are wondering why everything is slow or why we are not fully on board — that is one big reason," he says, adding that they don't want everyone to know where those areas are because someone may want to develop them in an non-environmental manner. As to comments from Battison that the TNG had the opportunity to participate in working meetings and public meetings, including the one in Alexis Creek on April 2 that was cancelled due to it being protested, Elkins says they don't want to participate in the provincial EA process because "it is not credible in our eyes." He says every mine under the process has been approved. "We are working with the federal environmental assessment process, which is co-ordinated with the chiefs," he says. "We are participating. It's not the B.C. process, which he (Battison) references, but we are working with the similar co-ordinated materials." He adds that since there isn't a signed contribution agreement, the TNG is reluctant to start spending money without knowing with confidence the funding is secured. "We can take it on good faith, but we don't have a lot of good experience with good faith," he says. He adds that while he is somewhat encouraged that the panel will still consider comments after the 60-day period for 30 days, he has concerns with what weight those comments will have. He says the panel says it will accept comments about aboriginal tile and rights, but the terms of reference say First Nations' traditional land use can't be evaluated or assessed. "Why ask for it if you're not going to evaluate it? Hopefully in the future they will clarify this." How many more movies about the end of the world do we need to watch? Apocalyptic feelings abound in literature, old and new, in the media, in casual conversations with loved ones and strangers. We all feel that something is ending, something is changing; but what is this change? Are we at the brink of a massive catastrophe? Are alien armies coming our way, planning to destroy us? What is the truth about this ‘end of the world’ idea? We could find an answer if we leave speculative answers to our artists and scientists, and start paying attention to what we can actually see. We can see pollution and its harmful effects, we can see the ever-growing garbage dumps; we can think about the devastation of ocean life by overfishing, and almost touch that great loss. There are concrete signs out there and within, signs that are pointing us in the direction of the changes we need to make together. Now more than ever, we must embrace our responsibility to this planet and all the beings with which we share it as our home. We must change our approach to the natural world from a colonialist and exploitative stance to an attitude of genuine respect and honor. We must put an end to the lifestyle of vanity and consumerism that harms the Earth and should no longer be sustained. More than care for the Earth, we must care about her. In these agitated times, when we are starting to see a worldwide water crisis emerge, it is more surprising than anything to see governments and corporations threaten the very existence of pure and clean water for all. Right here, right now, the people of the mining company Taseko have conceived the unbelievable plan of completely draining Fish Lake in their search for gold. Such an idea can only be called greedy and unintelligent. Gold cannot be compared in value to the precious fresh water we all need. What is the need for gold? Do we need jewelry more than we need drinking water? Do we value ornaments more than we value fish? Fish are alive; they sustain life in the region: Life, precious, priceless life. Get with the times, think apocalypses… This world coming to an end and Taseko dreaming about draining a whole lake for greed’s sake — You’ve got to be joking. There appears to be an accelerating urgency in the development of the Prosperity project. Considering the current economic and employment situation it is understandable. However, it is also increasingly clear that as the globe shrinks and climate change is upon us that Canada’s pristine watersheds are perhaps its most valuable resource. I would suggest that anyone conflicted by this question should drive out to the Taseko river and then visit the Highland Valley watershed between Ashcroft and Merritt. Perhaps then it will be less a question of urgency and more of reflection. When I was first involved in the political issues surrounding Aboriginal title and rights, neither the Province of B.C. nor the Federal government would acknowledge the existence of any special rights or title, even though they were painfully aware that the British North America Act entrenched Aboriginal rights under section 91:24. Aboriginal people across Canada began to blockade roads and other kinds of public utilities to put attention on the issues. At the same time, court cases were launched against both levels of government. These court cases were fought over the period of the last 40-plus years and set the stage for what is happening today. The BC Treaty Commission is a vehicle that is unworkable because of many of its negotiating principles. After millions of dollars are spent, very few treaties will be finalized because local aboriginal people will lose 85 to 90 per cent of their traditional land. The Prosperity Mine is no different, even after Aboriginal people have won a Supreme Court decision. The corporation and the local leaders insist that the proposed two kilometre hole in the ground is good for the environment and, of course, we cannot forget about the money! Instead of playing the same old game that has not worked, maybe some basic respect for the Supreme Court of Canada would work. Aboriginal people know painfully well how it feels when our history, traditions, and livelihood are affected by actions beyond our control. We do support the thoughtful and respectful extraction of natural resources. We have done this since time immemorial. We do not support the approach being taken by the government or the company. Most likely we never will. In the west Chilcotin, there has been heavy logging and milling for the last 20 years. Now everyone is gone and the local people have to live with the damage caused by people wanting only money and with no respect for the land. How many court cases must we win before the governments and corporations understand that things have changed? Instead of people blaming Aboriginal people for standing in the way of �progress,� why not educate themselves and the general public about the real issues such as the fact that the Fish Lake creek empties into the Chilcotin River, which in turn empties into the Fraser. This is just one issue. Think about an environmental accident and what it could mean for the province. Many things are more important than money. Our governments should be held accountable to ensure the extraction of natural resources are sustainable over a long period of time. I am responding to the reactionary hype regarding Taseko Mines' Prosperity proposal. While I appreciate Fulton's honesty, the ignorance and litany of offences directed toward the Tsilhqot'in is disrespectful and not constructive. seek to destroy any obstacle that stands in its way, in this case, the Tsilhqot'in. The way settlers, governments and corporations erase and ghost us out of existence is by not acknowledging that we are a nation with land. The nation's name, Tsilhqot'in, both refers to the Tsilhqox/river and dine/people because it cannot be separated. Since colonization is about occupation and legitimizing invasion, settlers try persistently to separate Nenqayni (meaning land and dine/people) from the land, hence the creation of reserves. "special interests" as if we have no voice, personality or status as people of this land. logging with no attempt to apply a sustainable eco-system approach. Again, the government is operating on a similar path of denial and neglect in the management of Taseko's Prosperity project, failing to accommodate the Tsilhqot'in nation in the decision-making process. guaranteed rights should be guaranteed. What rights often represent is the protection against the majority, the sensitivity to listen and honorably seek consent in matters that will permanently affect people's lives. "The majority of people in the area support the Prosperity Mine Project. Period." Williams Lake cannot claim ownership over territory that is not theirs to legally claim or land that is not their home to begin with. In assuming that Canada has legitimately stolen the land from Tsilhqot'in by drawing a map and waving a wand in the air with some magical incantations of sovereignty is absurd: there is no treaty to validate B.C. or Canada. in the Tsilhqox and Dasiqox/Taseko area? Group that won title case in 2007 back in court to stop development that is estimated would generate $5 billion in economic activity. Tsilhot'in Vows to Protect Teztan Biny (Fish Lake) from Prosperity Mine. Why does our society continually reproduce unhealthy relationships with the land? Where crisis may bring opportunities to reflect and act, a bunch of idiots ascending from the pits of time bring back the pioneering spirit. Perhaps it is a test to signify that settlers in Canada are still not home to this land; settlers still voyage the land to bring back spoils to the Empire. When there is talk of a time to act, where the forest industry is in peril, the slaves of dependency choose mining of all things. And when there is talk of mining, the language that is spoken speaks only in numbers: millions and billions of dollars! Yes, you�ll be swimming in gold! Hurrah! These abstractions fail to express what will happen to the land, to the fish, to the birds, to the rest of our community of creation. One reason why fish keep returning to the Ts?ilhqox (river) is because it is not poisoned like most other streams and rivers. But this we do not want to hear; it is contrary to neo-liberal ideology of destruction, exploitation and slavery. We would rather pretend to be jingling gold coins. The mining industry would like your mind to be as foolish as their philosophy for life, so put on those tunnel vision goggles, smile in delight, close your mind, and just listen to the numbers. And when the time comes, let us never reflect back on opportunities that have passed and the questions we should be asking ourselves, such as: What is a diverse economy? Why does our society continually reproduce unhealthy relationships with the land? What is our responsibility to living in a sustainable community? Thank you for promoting the Public Information evening the Friends of Nemaiah Valley (FONV) is hosting in Victoria. However, some clarification is necessary. The evening is not a �Prosperity information session�; rather, we are providing a platform to explain that First Nations territory continues to be alienated by the provincial government while it is the subject of a landmark rights and title case and that all B.C. lakes are at risk due to changes in the B.C. Mining Act. Specifically, �Fish Lake currently provides a classic family fishing recreational experience that is capable of meeting predicted demand well into the next century. It is FONV�s opinion that the present mining friendly attitude of our provincial government continues to interpret the facts in this light and that this is simply a wrongheaded stance. FONV supports the local Tsilhqot�in First Nations people, tourism operators and residents who have taken a stand against pulling the plug on Fish Lake. Also, Mr. Carruthers is not a �paid up member of FONV.� Apparently, he feels the needs to �keep an eye� on us in spite of the fact that all our research and activities are freely available on our website. Working to protect natural resources rather than exploiting them does not make us the subversive element in this story. Finally, the �open for business� attitude of the B.C. Liberals is not a mantra that will lead to an economic Nirvana. That our current government would even open the possibility of draining a lake that has been a food fishery for hundreds of years because it is not economical for Taseko Mine�s gold and copper mine to proceed otherwise, is frankly an absurdity and an atrocity. Victoria-based Friends of Nemiah Valley (FONV) is holding a public information fundraiser later this month at the University of Victoria titled: Fishing for gold in the land of the Chilcotin People. The event, set for Friday, Nov. 23 at UVic�s David Lam Auditorium, will examine the environmental, social and cultural impacts of Taseko Mine�s proposed Prosperity gold and copper mine 150 kilometres southwest of Williams Lake. Speakers will be Amy Crook of the Centre for Science in Public Participation, Murray Browne of Woodward and Co. and legal counsel for the Tse Keh Nay First Nations with regard to the Kerness North Mine and Amazay Lake, Chief Roger William of the Xeni Gwet�in First Nation, Chief Ivor Myers of Yunesit�in First Nation, and Jack Woodward of Woodward and Co.
Also present will be Tsi Deldel Chief Ervin Charleyboy, and Tsilhqot�in National Government administrator Joe Alphonse. FONV notes that the proposed mining project will drain Fish Lake, a small body of water near the outflow of Taseko Lakes, and the group asks: Do First Nations have the right to decide what happens in their own territory? FONV says the Tsilhqot�in chiefs are on record opposing any mine which calls for the destruction of Fish Lake. Bill Carruthers, chair of the Cariboo Chilcotin Share Our Resources Society, says his group is wary of a negative publicity campaign being launched in a far away place like Victoria opposing the Prosperity project. He says he is a paid up member of FONV so receives the group�s emails and newsletters. He says he joined the group to keep an eye on their activities. �The meeting looks pretty one-side to me, organized in Victoria without any local input,� Carruthers says. Asked if he plans to attend the meeting, Carruthers says Share is trying to find somebody in Victoria to be there on the group�s behalf. Carruthers says if the mine goes ahead it will have a big impact on the region. Re: The colonial gold rush continues, June 21. I totally agree with Russell Myers. In my view we are governed by a bunch of powerful suits, who seem to indirectly believe that the earth is their creation. Thus, providing the proof that a person doesn�t require a great deal of measurable intelligence to succeed within a colonial reality. Don�t get me wrong, technology is a wonderous human feat. However, respecting the integrity of our life giving earth, is proving to be an even more wonderous feat. I seem to recall some confusion concerning the proposed development at Fish Lake, and other potential mining and oil explorations. I know the Taseko mining company is hungry to rip up the earth and drown themselves in gold. I know that the colonial governments of Canada, BC and Williams Lake look forward to siphoning the profits. I know that greed is sadly rewarded as a base virtue in this society. I see advertisements for jobs and money�that�s all! What a pathetic philosophy for life. The colonial pioneering spirit is not over. The confusion that confronts us is this: there is a fundamental denial in the fact that Fish Lake is Ts�ilhqot�in territory. 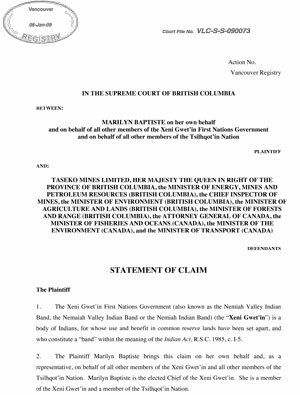 All of the Ts�ilhqot�in is unceded land, it is contested in the Xeni Gwet�in court case, it is contested in letters, words, stories, and the minds of people who live and act responsibly towards the land. I am family to the Ts�ilhqot�in from Yunesit�in and Xeni Gwet�in. I am the dissent of a rallying public. All land is sacred and there exists a moral duty not to destroy because the land is a culturally diverse economy already � it should continue to be so. Fish Lake is a home, and if you are not home to this place, then you must ask yourself if you belong and whether you can make a morally justified claim to its destruction. In response to comments made on the economic development of Prosperity Taseko Mines at Fish Lake in the Chilcotin by Share Cariboo Chilcotin Resources. I can point out that such groups of money-minded people as that, and including Cariboo-Chilcotin Land Use Plans, CRD and others of the like, do not talk to the real stakeholders, the Tsilhqot'ins. The foreign governments and industries have collectively devastated and raped our lands and resources without proper process which may be illegal to date. Logging practices have done extensive damages to our heritage, sacred sites, including grave sites, and our traditional use resources on our land. The late Ministry of Forests' trap trees program invited bark beetles from all over the world to attack and kill our trees. Now they're inviting other chemicals from all over the world to attack and kill our lakes, rivers, wildlife, domestic animals, plants and unique watersheds by proposing heavy handed approach on the development of mining by Prosperity/Taseko company. I suggest that the public owned company is misusing and misleading with monetary gain while ignoring the true livelihoods of the Tsilhqot'in health and weal-being. The realities our Tsilhqot'ins are facing is that when our resources are contaminated and depleted that we know we cannot eat money that's in the air. The interim investment to be made by a public owned company such as Prosperity-Taseko Mines must not be allowed to destroy the public of the Chilcotin inhabitants, and stand to lose such a unique sustainable lifestyle of living off the land and its resources. The public investors may stand to gain substantially on the short term, but the long term loss is far more substantial to negatively impact the good health of the public in its current survival status. The non-aboriginal public needs to positively support and rely on the Tsilhqot'in aboriginals to protect our public health, lands and resources from foreign encroachment on our rights to live healthy. The best motto for this fa�ade is "keep your money to yourselves and keep your hands off our livelihood, resources and health." Add on this concept if the Williams Lake TimberWolves picked up our First Nations goalie Carey Price, back in the day, they can truly share in the honour of his success and Williams Lake would be in a better position not to lose their junior hockey club from the Lake City. Believe the truth that the Cariboo Chilcotins need our First Nations support. I was glad to read that Mr. Carruthers acknowledges Fish Lake as a pristine and unique wilderness setting, however I can't share his vision of an economic crisis if we don't destroy parts of one of our last intact ecosystems in British Columbia. While I can see the necessity of providing jobs in this area, providing just short term mining jobs which will destroy long term sustainable jobs, for instance in the tourism industry, does not solve the problem in the long run � quite the opposite. It will create more problems for future generations in the big picture. I can't as well see the mining operation as a small footprint with proposed dimensions of a two square kilometer hole in the ground with the complete infrastructure built to access this remote area. Interfering with nature in such dimensions will definitely have a ripple effect to the wider area around it. I do agree with Mr. Carruthers that the local communities, in this case the Chilcotin First Nations, should be key to any decision made on resource extraction in this area. We all should consider that the big economic benefits of this mine will not be in the hands of local workers or communities in the Cariboo/Chilcotin but in the pockets of shareholders of the mining company. I would like to suggest that Mr. Carruthers makes a more thorough research about the complete long term economic implications of a project like this compared to the facts presented in his letter. Since the information provided about FONV was not correct I have to assume that the economic facts used weren't complete either. His mentioning of the sewage problem in Victoria is actually a good example of a short sighted social and economic decision based on wrong facts in the past, which now affects future generations. Lets not make the same mistakes again and protect the pristine areas in the Cariboo/Chilcotin for the sustainable long term use. I hope we all will realize that we can't eat money before the last fish is caught, the last animal is killed and our environment and water is poluted. We were glad to see Mr.Bill Carruthers, Chair of Share the Cariboo Resources Society, respond to our letter opposing the Taseko Mines proposal that would destroy Fish Lake. This is the kind of public discussion that should take place around any large development proposal with significant social and environmental consequences. There will indeed be a decline in employment as the logging mega-project now underway in the Tsilhqot�in winds down. This was always in the cards, even without the mountain pine beetle. The Ministry of Forests is well aware that the recent level of logging, and the milling capacity it generated, was never meant to be sustainable .The pine beetle has simply accelerated the process. It will generate employment, but the Prosperity Mine is a short-term solution to a chronic dilemna. This is one of a community economy dependent either on the extraction of non-renewable resources or the over-extraction of renewable resources that, if they were to be managed differently, would sustain the community in perpetuity. An economic argument alone is never sufficient to justify trashing the environment; there is an even stronger economic argument against the destruction of Fish Lake if we take the long view. It is a mistake to speak of Fish Lake as only one of 400 lakes in the Tsilhqot�in as if that in some way minimizes its loss. At what point does this kind of argument end? May we anticipate the loss of, say, twenty such lakes, or 200, and still say there are 380 or 200 left so that�s okay? Fish Lake does matter. It supports a sport fishery and a food fishery; it�s an integral part of the Taseko and Chilko River watershed; it has significant value, now and in the future, to First Nations, local residents, and tourism interests. It is disingenuous to claim that this mine will have a small footprint. The environmental and social footprint will be immense. Mr. Carruthers makes no mention of possible long term consequences to the Taseko and Fraser River salmon runs, of the high traffic volumes on the Taseko/Whitewater road and the impact on wildlife. He does not mention the loss of local lodge operators who require the maintenance of those wilderness qualities that this mine will destroy. Negative social and cultural consequences for the First Nations people of Xeni and Stone is a virtual certainty. We do agree with Mr. Carruthers that First Nations will and should be those who play the major role in a decision one way or another. It is they who will make the final decision. I know that they are considering the implications right now. A note regarding the comment that we are a Victoria based organization with no roots in the area. Four of our ten directors are landowners in the Brittany Triangle. Friends of the Nemaiah Valley has strong ties to the Xeni Gwet�in First Nations Government through formal protocols and personal friendships. Strait of Juan de Fuca! Victoria and Nemiah Valley, B.C. This is a response to the Friends of Nemiah Valley and their letter to the editor on Dec. 21. First of all, we need to clarify the issue of the pristine Fish Lake. It is pristine, and in a nice wilderness setting, but it is one of over 400 lakes in the Chilcotin. What the people of the Cariboo Chilcotin have to decide is, is it worth it to approve the mine project and only have 399 lakes after approval. Yes, it will be a huge economic generator with the timing being very close to the fall off in the logging industry because of the devastation by the Mountain Pine Beetle. Certainly people employed in the logging/lumber industry will probably end up being employed at the project, but if it doesn�t go ahead then the Cariboo communities are facing an economic crisis that will have social impacts as well. Any discussion about this project must certainly contain discussion about impacts on the environment in the Fish Lake and surrounding area, but it must also look at the bigger picture, this being the trade offs that we make with any decision that will impact land and resources. We cannot embargo all of the Chilcotin, nor can we utilize all of the Chilcotin. At some point the people of the Cariboo Chilcotin will have to make this decision and key to this will be what the aboriginal communities decide themselves. They are the largest group that will be directly affected and we assume that they will be assessing what positive or negative impacts this will have on their way of life. The footprint of this mine project is very small relative to the total of the Chilcotin and the current laws require that the project must be reclaimed back to its original state. In a lifetime, this project will be developed, mined, reclaimed and back to its original state as a pristine wilderness area. It will all be done according to the current laws regarding projects of this nature and within guidelines that society has established as well. The Friends of the Nemiah Valley are opposed to this industrial project, but what bothers me is that they are Victoria-based with no roots in this area. They are saying no to a project from their perspective, which is not fair to the people of the Cariboo-Chilcotin. Incidentally, the Greater Victoria Regional District is still pumping raw sewage into the Strait of Juan de Fuca. Maybe they should clean up their own backyard before they comment on ours. We will look after our own backyard and decide what is best for sustaining our communities and way of life. This letter is in response to the article of November 29 (Tribune), where B.C. Minister of Mines Bill Bennett wanted "to get people thinking about the value of mining in relation to the footprint on the land." Stating in short with technology available today and the environmental assessments considered as manageable risks to the environment, Fish Lake would be partially or completely drained. The minister's thought provoking proposal comes down to the trade of local environment for jobs and local economy. The proposed destruction of Fish Lake for the extraction of gold carries a lot of hope to an area that has experienced uncertain economic sustainability in forestry and mining. Perhaps even more so now with the seriousness of the pine beetle epidemic adding further pressure to the wood and lumber industry as well as the obvious but not as emphasized threat to the tourism industry. The remote Fish Lake is teeming with trout and the surrounding area is ideal habitat for wildlife. Considering that this is one of the few self-supporting local lakes in terms of naturally occurring trout would make this one of the first of many serious choices society must make in regards to approving this mine. The added cant of saying the company (Taseko Mines) would create double the habitat by populating other barren lakes seems an incredible trade off the B.C. government is all too willing to back. How can you disregard the fact that this is viable fish and wildlife habitat simply by insinuating that a mining company can create something better than the existing healthy eco-system? I cannot agree to the choice to destroy yet another chunk of nature for economic benefit. This proposed business development will have negative influence on the area, which is our business and livelihood. We, a family of six, make a simple but good living in association with the area. It is something we have invested our heart and soul, time, money, and attention. We operate a horse-based, low-impact guiding and tourism business at Taseko Lake. The pristine wilderness we advertise, use, and enjoy is not as readily available in beautiful British Columbia as one would hope. Mining, forestry, road access, and user abuse decreases the wilderness and beauty of an area considerably, generation-wise, permanently. In our business, it is a must to be as pristine as possible - another man's industry and garbage fall terribly short of adding to the employment and quality of anyone's wilderness experience. If the government sells us a licence for wilderness tourism and we invest into these remote areas, how is it it can just write us off without consideration on consultation? It seems tourism outside the city limits is not acknowledged as the self-sustaining industry that has played a part in B.C. 's economy for more than 125 years. Nor does the government recognize the need to ensure the longevity of wilderness tourism by supporting established lodges and resorts through designated wilderness areas surrounding these remote facilities. We are at the mercy of the unrelenting appetites of the ever expanding forestry and mining industries. We are told to move our trails or to simply consider an area as having no visual value. This seems like industry discrimination. The proximity of the proposed mine to our quiet, secluded lodge location would be devastating. The noise from vehicles and machinery would ruin the peace and solitude we are known for and cherish. Besides the noise pollution would be the more fatal issue of access. The old mining road, though in serious disrepair, sees upward of 100 ATVs and 25 to 30 trucks going past our gates in a summer season. There is no real monitoring or management of the traffic. Except for a few special people who care enough to carry out what they carry in, we have seen everything from abandoned tents to car batteries left behind along a route that leads into some of the nicest wilderness, we think, that B.C. has to offer. Worse than the removable mess are the ripped up meadows, high marked rocky hillside above the tree line, trees destroyed, and trails being cut in all directions. Now add 500-plus motorized mine employees doing their own 'exploring' into the area. If each tells a few friends of their exploits the area we know and love will rapidly be overrun and ruined. The footprint is getting deeper. By the way, the mine site at Fish Lake is littered with garbage, insulation, wood, plastic sheets, and boxes laying everywhere. The existing mess is such a disgrace we access the lake via horseback from another route to avoid the not-so-well managed operation of a previous, not recent, mining era. And once the mining company settles in here, what is stopping its further development into the Taseko area? In example, Red Mountain, Taseko River, Battlement Ridge, Iron Creek, Granite Creek, etc. This small area, approximately 1,500 square kilometres sitting between the South Chilcotin Mountain (Big Creek) and Ts'yl-os Provincial Park seems to be wide open for logging and mining where, in reality, this is a much needed buffer zone better left intact. With such a heavy emphasis being played by the B.C. government on their serious obligation to 'consult and accommodate' in regards to the First Nations interests, it seems funny the B.C. government is so unaware of the Xeni Gwet'in First Nation ongoing work in its eco-based land use plan for the traditional territory, this including the Taseko area. As a local wilderness tourism operator we support the principles of the Nemiah Aboriginal Wildlife Preserve Declaration of 1989 as well as being involved in the recent Sustainable Tourism Protocol Agreement of 2003. This proposed mining activity is going against these statements and the eco-based plan and will adversely affect the community process that is underway. One further real close concern being that big business will once again get special rule over small existing businesses and individuals. I understand that to ensue its investment, the company must seek lease/title to eight square kilometres. And, as government is so eager to back this big business move, I am concerned that this large land application will go through -- destruction, drainage, and all. Yet, when we made an application to lease/title 80 acres around our lodge to secure our investment, we were denied. This included an existing area licenced for land use for nearly 60 years. It would seem that everyone associated with the '500 jobs and literally hundreds of other people who work in jobs related to mining, will benefit here. Obviously my environmental and personal concerns hold little importance when compared to the big mining picture in B.C. The minister speaks of the trade off people of the province have to decide upon. The trade off is our livelihood and our lifestyle, and a much large piece of wilderness than the footprint being paraded. I have been thinking, what else is expendable in the Chilcotin -- lakes? environment? people?